The Year of the Runaways tells of the bold dreams and daily struggles of an unlikely family thrown together by circumstance. Thirteen young men live in a house in Sheffield, each in flight from India and in desperate search of a new life. Tarlochan, a former rickshaw driver, will say nothing about his past in Bihar; and Avtar has a secret that binds him to protect the chaotic Randeep. 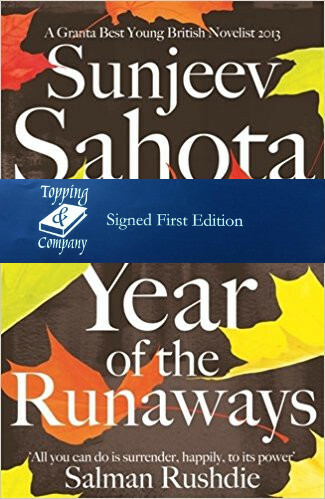 Randeep, in turn, has a visa-wife in a flat on the other side of town: a clever, devout woman whose cupboards are full of her husband’s clothes, in case the immigration men surprise her with a call.Sweeping between India and England, and between childhood and the present day, Sunjeev Sahota’s generous, unforgettable novel is – as with Rohinton Mistry’s A Fine Balance – a story of dignity in the face of adversity and the ultimate triumph of the human spirit.